I was thrilled to be selected as one of 45 artists chosen to be part of the “Inspired Beginnings” juried exhibit at Ashton Gallery in San Diego. This is a collaboration between the Oceanside Museum of Art Artist Alliance (of which I am a member) and the gallery located in the dynamic neighborhood of North Park. 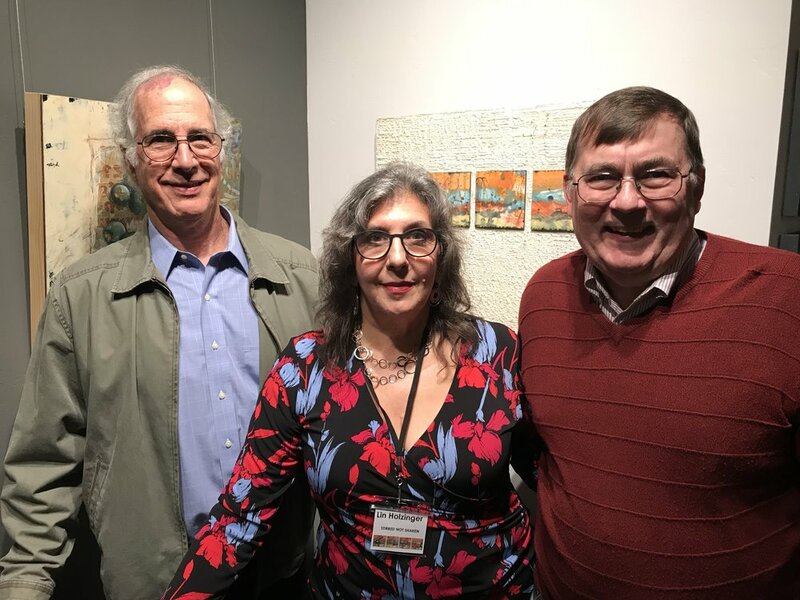 Gallery founder and juror, Kate Ashton, organized a fabulous and very well attended opening reception that showcased the 68 selections (from 260 submitted pieces). OMA AA planning committee members were on hand to help host the event and support their Alliance members. Stop by to visit the Gallery. The Inspired Beginnings exhibit runs through February 8, 2019 at Ashton Gallery/Art on 30this located at 4434 30th Street, San Diego, CA 92116 - Phone: 619-894-9009 - https://www.arton30th.com. Hubby Bob and Buddies Mike & Michele (taking this photo) Switalski helped me celebrate!